My botanical name is Dracaena deremensis ‘Torch’ and I’m part of the Dracaena family. I have a slender stem and dense spiraling deep green foliage. I am native to Asia but was born in a nursery in Florida and am so happy to be going to my new home. 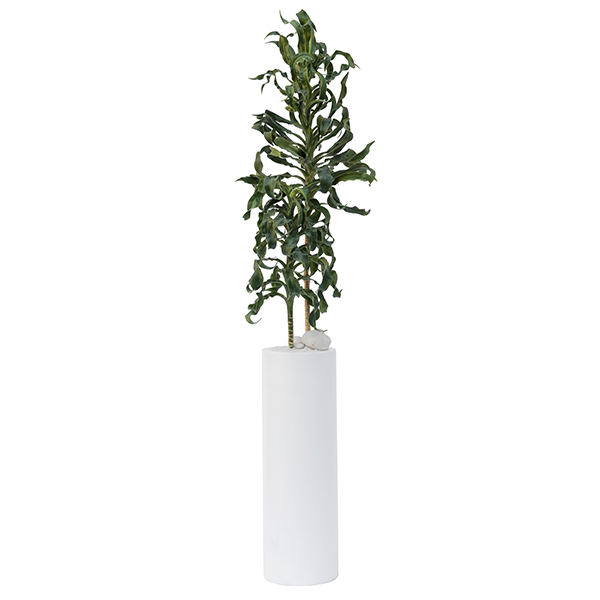 I can grow to be 5-6 feet tall and will add beautiful full, green look to your home. Here are some care instructions and tips that will be useful as I get acclimated to my new home and grow with you for many years to come. I can live indoors anywhere in the world as long as the temperature is comfortable for my fellow humans at around 65 – 78°F (15 – 24°C). I’m a great indoor plant and have some tolerance of lower light conditions but I really do best in moderate to high light locations. The best place to put me is in front of a window or glass door in a well-lit spot. You can also situate me farther in a room as long as I can get some good light for the majority of the day. I’m ok with artificial light, as long as it is the bright fluorescent type that is always on during the day. Please do not place me in a spot where I will get strong direct sunlight. Also, watch out that I’m not directly in line with an A/C vent as I really do not like cold or hot air hitting on me. Please do not move me once I get situated as it takes me some time to get acclimated. You can rotate the container slightly every couple of weeks so I get good photosynthesis action going on all sides. Place me in a shaded or covered area where I can get bright natural light but not direct full sunlight. If the area is not covered and has possibility of rain water coming through, make sure the planter has drainage holes at the bottom. Call the store to request assistance if needed. When it comes to watering me, below are some helpful suggestions for you to follow. However, I must admit that each of us is slightly different than the other and our needs differ too. Depending on where you end up placing me (bright light location would be best! ), I may get more or less thirsty and would require watering differently. The humidity in the room, the time of the year, the amount of AC/Heating, among other factors will all affect my watering needs. Fortunately, it’s easy to figure out what to do as I will show you how I feel, you just need to check up on me once in a while. Unlike other dracaena plants that are sometimes planted in lava rocks, I’m Florida grown and am planted in soil. This makes it easier to feel the humidity in the soil and control the water. If I’m situated in a bright light location, start by watering me once per week. If I’m at a medium-low light location, every two weeks. Using a spray bottle, watering can, or measuring cup, water me approximately 25 oz (750 ml) of water. Pour water directly on the gravel and rocks very slowly all around the base so that it filters down. Watering is no good to me if the water runs down the outside of the root ball, leaving my central roots dry. This can happen if you water too quickly or apply too much water at once. Slower watering is usually more effective. The key is to ensure that water gets to my root zone. Sometimes it is helpful to prick little holes into the gravel and soil with a knife/pencil and pour water inside to assure it goes down well. Generally, Dracaenas are houseplants that does best when kept on the dryer end of the water spectrum, however it does well with a consistent watering schedule. Use more of a regular distribution, limited portion control mentality when watering it for best results. Check up on me after about a week by inserting your finger in to the soil about two inches and feel the moisture level. If it feels moist, try again in a couple of days. If it feels dry, water me as instructed above. Once we do this for a few weeks, you will get the hang of it and you can work out a consistent watering schedule. I DO NOT LIKE TO BE IN SOGGY SOIL so make sure you are not overwatering me. I do not have a great need for food like other plants as I’m naturally very slow growing and will not be able to digest additional nutrients too well. Do not worry about feeding me until after 6 months using a liquid fertilizer which you can purchase at the Plant The Future store or at any garden center. I like the 20-20-20 formula. Follow the instructions on the label for best results. Most symptoms that I may be showing can be due to a number of different causes, so we will need to identify the problem by process of elimination. Why are the tips and edges of my leaves are turning brown? This is usually caused by overwatering and/or buildup of salts and chlorine from the tap water. Remember that I prefer to be more on the dry side so check the soil to see if I am getting too wet. If so, reduce the frequency and/or the amount of the watering slightly. It would also be great if you could use distilled or filtered water instead of tap water to avoid the salts and chemicals. I would suggest that you cut the brown tips of my leaves using a scissor as I get adjusted. Cut the tips in the same shape as they were originally please! Why is the entire leaf is turning yellow or brown? This is usually signs that I’m not getting enough water. Please increase the amount of water and/or frequency of the watering. Remember to check the soil as instructed above. What should I do if I’m losing my leaves? If it is only my lower leaves that drop (one by one) over a period of time and all the top leaves are fine, it is usually due to me having an initial shock of relocation and/or my natural tendency to drop leaves in order to channel my energy to the new growth. In this case, continue watering me as instructed and remove the dead leaves at the bottom. As I grow, new leaves will sprout on top. If many leaves fall all of the sudden in the top part, then it must be something in the environment that is not making me feel very good. It can be an AC vent that is blowing hot/cold air on me, I may be getting burned by direct sun, or experienced some sudden change in temperature. In this case, move me to a better location and monitor me over the next few days/weeks. I have brown/yellow spots on my leaves, what do I do? This could be due to a number of problems including fungal disorders, bacteria, or insect damage. Root rot is a common fungal disorder that develops when my soil is constantly wet. My leaves may turn brown-to-black and curl up, eventually falling off. Root rot can be treated by withholding water for a while until the soil is dry and then continue watering again. Another fungal disorder may be Anthracnose leaf spot that spreads on leaves in moist, wet air. In both cases, brown spots would appear on my leaves, but in leaf spot these tend to grow gradually in size and may be sprinkled with black dots. Leaf spot can also be caused by bacteria. If It looks like leaf spot, remove all of my infected leaves and avoid wetting the foliage when you water. I should be able to eventually recover from either disorder if damage isn’t too severe. Brown spots may also result from insects feeding on my leaves, causing injured portions to brown and eventually die. Mites, which are microscopic pests, may cause this problem. Although they’re invisible, their webs are usually obvious, especially on the younger leaves. Mealybugs can also cause leaf browning that sometimes appears as spots, especially where leaves join stems. These insects resemble tiny puffs of cotton along the stems or on leaves. You can destroy both pests by spraying me periodically with insecticidal soap that you can find at the Plant The Future store or at a garden center. Follow the instructions on the label.